Every once in a while I just feel a need to get the oils out. The result is usually somewhat less than happy but I do it anyway. I guess my temperament is more suited to acrylics. However once in a while it does work out, in fact my latest oil painting may be my best oil painting to date. I painted this one entirely with a palette knife which may be why it worked out, however it's hard to layer thick oil paint on top of thick oil paint, at least I don't have the touch for it. The painting is based on one of the charcoal studies I shared in the last blog post which was based on a photo I took in Ogden Valley Utah late fall a few years ago. 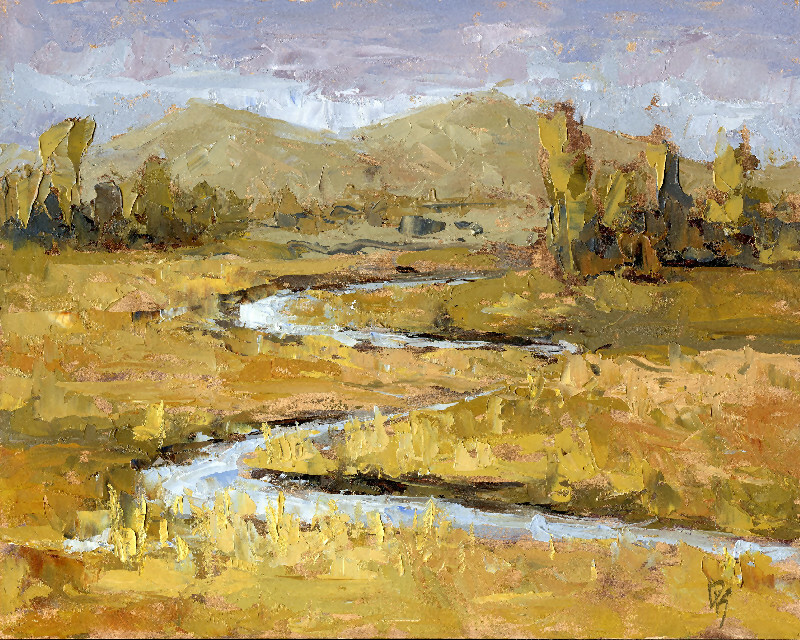 The thin little stream of water meandering down the yellowish-orange marshy area made for a great composition, of course the trees and hills in the background helped in their secondary roles. Ogden Valley is one of my favorite areas to visit any time, but especially during autumn.